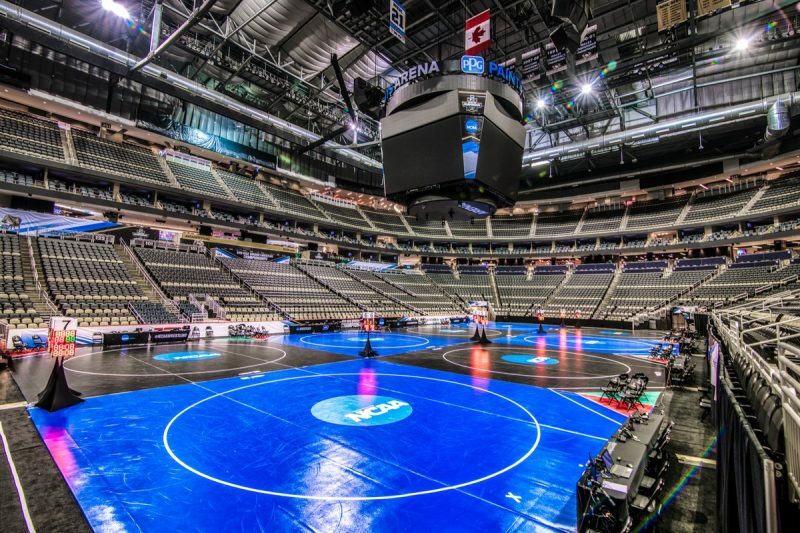 PPG Paints Arena is set to host the NCAA Division I Wrestling National Championships from March 21-23 in Pittsburgh. The end of March is always synonymous with tournament time, though usually we’re thinking of basketball. But with the 2019 NCAA Division I Wrestling Championships in Pittsburgh from March 21-23 at PPG Paints Arena, March madness has extended to the mats. The best wrestlers from around the country will gather for an individual title at 10 different weight classes. Pennsylvania itself is well represented in the competition, especially by Penn State. The Nittany Lions are a force to be reckoned with within the sport and send nine competitors to this year’s competition, with seven of the nine a top-3 seed, including three overall No. 1s in their respective weight class. With the spotlight on Pittsburgh this week we took a look around the state at eight of the top facilities to host a tournament at, with an eye out for how and why wrestling is such a staple of life in Pennsylvania. Formerly known as Cambria County War Memorial Arena, this building holds a lot of history. Famously, it served as the filming location for the 1977 sports comedy film Slap Shot. These days, while hockey is still played in the arena, wrestling has become another focal point. 1st Summit hosted the 6th Annual PA Junior High State Championships in early March. With 4,000 seats available, there’s plenty of space to take in the building’s past while watching its future as well. Founded nearly 16 years before the Revolutionary War began, Germantown Academy is the oldest nonsectarian day school in the United States. In modern times, the school plays host to some of the top wrestling talent in the state throughout the tournament season. In April the school will host qualifier tournaments for both Greco and Freestyle wrestling, where qualifiers will earn their way to the PAWF State Championships. The academy also hosted the 2018 Battle at Germantown Youth Duals in December of 2018. Bolstered by a $4.7 million facilities update in 2016, the Giant Center has become a haven for wrestling within the state. 10,500 seats greeted spectators who flocked to the arena in February for the PIAA State Team Tournament and then came back in March for the PIAA State Championships, the individual titles for those at the high school level. Additionally, the facility welcomed the NCAA Division III Wrestling National Championships in 2015. A hotbed for all things fitness related, the Monroeville Convention Center has hosted its share of wrestling, bodybuilding and powerlifting events this decade. The facility will host the Crusade Open duals on May 4-5, with competitions across the weight levels for high school, middle school and elementary school athletes. Though Lehigh doesn’t get the acclaim as programs like Iowa, Penn State and Ohio State, the school has been a hotbed for wrestling for decades now, thanks in part to world-class facilities like the Caruso Wrestling Complex. The program sent 10 wrestlers to the NCAA Division I tournament last year and has eight more competing this time around. The school itself hosted the 84th National Prep Wrestling Tournament at Stabler Arena in February of this year. As the home of the NHL’s Pittsburgh Penguins, this arena has seen plenty of big games and hoisted a few banners to the rafters this decade, making it an ideal backdrop for tournaments of any kind. It’s not surprising then that the arena is the home of this year’s NCAA Division I Wrestling National Championships. Student athletes will have plenty of floor space to work with while nearly 20,000 fans can take in all the action of this year’s premier tournament. Like its rivals in Pittsburgh, Philadelphia is no stranger to hosting top tournaments and events and was the host site for the NCAA Division I Wrestling National Championships as recently as 2017. The arena provides seating for 19,500 fans, offering top-notch views for any major wrestling tournament. Tyrant Wrestling has been bringing some of its marquee tournaments to the York Expo Center for the past few years. 2019 is no exception, with the company hosting its Columbus Day Duals in late October. The event has become the largest preseason dual meet tournament in the country, with the 2018 event drawing wrestlers from 22 states across 43 mats in the girls division.